50th anniversary box set edition from November 2018, now available as a standalone release. More information: Originally relased as part of the 50th anniversary box set edition in November 2018, now available as a standalone release. Jethro Tull's debut album ‘This Was’, originally released on 25th October 1968, was an album which made Jethro Tull one of the world’s most successful progressive rock bands. On 2nd February 1968 the foursome played their first gig under the name Jethro Tull at London’s legendary Marquee club. Ian Anderson has always regarded that date as the birth of Jethro Tull, “For me it’s the first proper gig as “Jethro Tull”. In June 1968, just before ‘This Was’ was recorded, the band began a residency at the same London club. The album was funded by the band as at the time of recording there was no record company contract in place with the band presuming, correctly, that a deal could be made after the album was finished. Just before the release in the U.S., guitarist Abrahams left to form “Blodwyn Pig,” primarily due to Anderson’s preference for a less blues-orientated future, with the album notes stating "This was how we were playing then – but things change – don't they?" 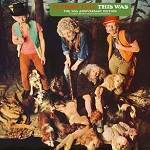 ‘This Was’ debuted at number 10 in the UK album chart thanks to great airplay from BBC Radio DJ John Peel. The band began their first US tour in January 1969 with guitarist Martin Barre.